Video on the sacred relationship of Satguru and Sikh as father and child has been released by Brig. Partap Singh Ji Jaspal (Retd. ), founder of the Guru Nanak Daata Baksh Lai Mission. The video is titled "Hum Barik Tum Pita Hamare, Tum Mukh Devo Kheera" and is available for free on the mission's websites. Brig. Partap Singh Ji Jaspal (Retd.) 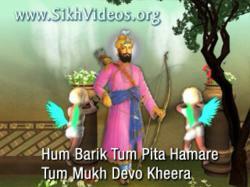 has released a new video titled "Hum Barik Tum Pita Hamare, Tum Mukh Devo Kheera". God is loved by His devotees in many different ways. This video covers the Love between God (Satguru) and His devotee (Sikh) as Father and child. This unique video cites many references to this relationship from the Gurbani of Sri Guru Arjan Dev Ji and Sri Guru Ram Das Ji as enshrined in Living Sikh Guru, Sri Guru Granth Sahib, and explains them in an easy to understand manner. The title of the video is taken from Sri Guru Granth Sahib (884) and translated it means - "I am Thine child and Thou art my Father. Thou puttest milk into my mouth". Brig. Partap Singh Ji writes about God's love for His children in the chapter "Martyrdom" from "Eternal Glory of Sri Guru Tegh Bahadur Sahib" - "A worldly mother takes upon herself all the sufferings and inconveniences to make her children comfortable. God is loved as father and mother and is addressed in many holy hymns as such. All beings are His children. The Ninth Guru Nanak, a true manifestation of God, demonstrates the divine climax of God's love for His children. For God there is no discrimination between His children on the basis of faith, belief or religion. With equity, the Great Guru accepts all of them and saves them. He had incarnated for the sake of love for the children of God. And He alleviates these sufferings and redeems them with such a grandiose and exemplary excellence." As with the all the videos of the mission, it may be watched and downloaded for free from the mission's websites - http://www.SikhVideos.org and http://www.SriGuruGranthSahib.org. Visitors may forward clips of the video to their friends, acquaintances through the feature of 'send videos as present' given with each clip. Guru Nanak Daata Baksh Lai Mission, founded in 1999 by Brig. Partap Singh Ji Jaspal (Retd. ), is at the forefront of promoting universality of Sikhism and its Divine Content, embracing the whole mankind as one global family of the sole beloved God. It reaches out to the world through the mediums of internet, TV channels, audio and video productions, and book publications. The mission seeks no publicity and serves the whole global community in the firm belief of oneness of godhood and oneness of the mankind. This mission is purely a labor of love of a family group and is based at 203, Sector 33-A, Chandigarh.